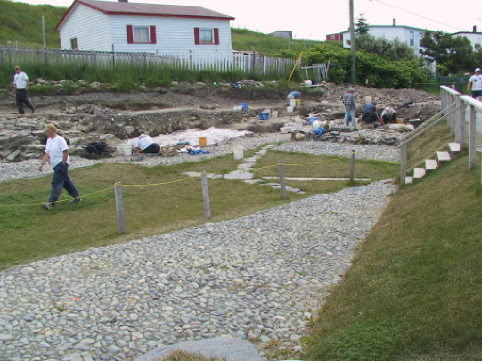 Colony of Avalon in Ferryland with its cobblestone roads, and foundations of ancient buildings made from slabs of black rock. A dedicated group of archaeologists are discovering Colony of Avalon buried only a few feet underground. During the reign of King James I Anglicans were the only people allowed to have a political position in Britain. Unfortunately for George Calvert who had changed his religious beliefs to Roman Catholic and had to retire as Secretary of State. Afterwards Calvert was given the title of Lord Baltimore. During 1620 Calvert purchased land just south of Aquaforte to Caplin Bay which is now the town of Calvert from a British businessman. Due to the thriving fishery of the time Calvert had a great opportunity he could not resist, and he sent a group of 25 men and seven women to establish a colony. 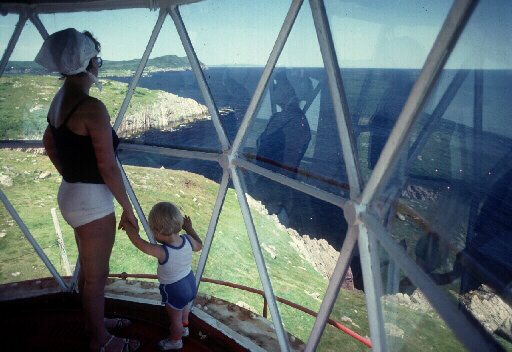 Authorities differ on the derivation of the name Ferryland. It has been written as Forillon, Foriland, and considered by some as a corruption of Veralum which was the ancient name of St. Alban's in England. It was first visited by French fishermen as early as 1504 and used by them as a base for the summer fishery. It was these who called it Forillon, which meant "standing out or separated from the mainland" and described the peninsula now known as the Downs. The French abandoned their East Coast resorts early in the sixteenth century and went each summer to the south coast where fishing begin a month earlier. 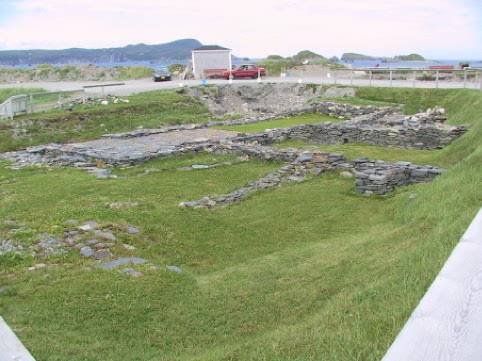 Englishmen then came and built temporary housing at Ferryland, and so a century passed until Sir George Calvert, the first Lord Baltimore, applied in 1621 for a royal charter to colonize a portion of Newfoundland. In 1622 he received a grant of part 'of the southeastern peninsula, with quasi-royal jurisdiction. He named his province Avalon. Sent out to Ferryland as Baltimore's agents to supervise construction work. Wynne described the progress made up to late autumn of 1622; "The range of buildings was forty four foot of length and fifteen foot of breadth, containing a hall, entry, cellar, four chambers, kitchen, staircases and passages. A face of defense was raised to the water sideward." After Christmas there were added a parlour fourteen feet long and twelve feet broad, a lodging chamber, a forge, salt works, a well sixteen feet deep, a brew house, a wharf, and a fortification "so that the whole may be made a pretty street." Land was cleared and in the spring wheat, barley, oats, beans, peas, radishes, lettuce, turnips, cabbage, carrots and kale were sown. Baltimore spent forty thousand pounds on his colony, but profits were slow to materialize and he tardily began to suspect that all was not well at Colony of Avalon. He came out with his family in 1627. In his letters to King Charles I he complained of raids by French Men of War and requested protection by British ships. Lady Baltimore found the climate too severe for her frail health and in 1629 she and her son Cecil left Newfoundland for Virginia. Her husband then decided to abandon Ferryland and obtained a grant of land in Virginia, where he and many of his colonists moved. Calvert's province in Newfoundland had been named Avalon. Around this name centres the most beautiful legend in our island story. It carries us back to the beginning of the Christian Era, and to the occupation of Britain by Romans. It was Joseph of Arimethea who took the body of Christ from the cross, and it was the same Joseph of Arimethea who first preached the Gospel in Britain. At Glastonbury in Somerset, he built a church, and, in time, a great monastery was built there. It was there the tomb of King Arthur was found in 1191. Glastonbury was surrounded by fens and was called the Isle of Avalon. Among the ruins there blooms twice each year a hawthorn tree still known as the sacred thorn. Tradition tells us that Joseph carried with him to Britain a staff from the tree that became the crown of thorns that Christ carried at the Crucifixion. The disciple planted the staff at Avalon, where it lives and flowers each May. Baltimore, who was a graduate of Oxford, was thoroughly versed in English legend. He envisioned an Avalon in the far West, where, like Joseph of old, he would build a shrine of faith amid the darkness of heathen lands. He brought missionaries with him who, like Arthur's knights were pledged: "To reverence the King as if he were Their conscience, and their con- science as their King. To break the heathen and uphold the Christ." "Calvert seems to have been so thoroughly driven with this idea of establishing Christianity in the New World, that it lends a tinge to each incident of his enterprise. Thus we find that he gave the name "The Ark of Avalon" to his main ship, and that of "The Dove" to her sister ship. On a coin which he had stamped is seen a thorn with the motto "Spina Sanctus" (sanctified by the thorn). On the other side there is a harp or lyre, surrounded by a wreath of bay leaves and bearing the inscriptions, beneath the lyre "Orpheus," and above, the Greek legend "The air is the best" (Ariston men Aer). There are a mitre, crosier and cross, and a shield with a thorn and oak. On the margin are the words "Pro Patria et Avalonia." The history of Colony of Avalon does not stop with Lord Baltimore’s death. He had previously appointed a representative to act on his behalf, this man was Captain Wynne. While becoming familiar with his new job as representative another Englishman, Sir David Kirke, was granted the entire province of Newfoundland in a settlement because he conquered Nova Scotia and Quebec in a battle. Kirke had to give back Nova Scotia and Quebec under a new treaty following his successful attacks. Eight years after Baltimore vacated Ferryland, Sir David Kirke took over the property under charter from the Crown. Kirke and his family settled in Colony of Avalon and evicted Captain Wynne from the mansion and assumed control of the colony. George Calverts son and heir proceeded to sue Kirke in a British court. Kirke was born in Dieppe, France, the son of a London Merchant and a French mother. Because of religious troubles he came to London and he and his brother were given a commission by King Charles I to outfit warships to prey on French commerce. Kirke made possible the colonization of Nova Scotia by Sir Alexander Macdonald, and captured eighteen French sail bound for Quebec. That town was forced to give up in the following year, 1629. Peace was proclaimed between England and France, and Kirke was ordered to return what he had conquered. 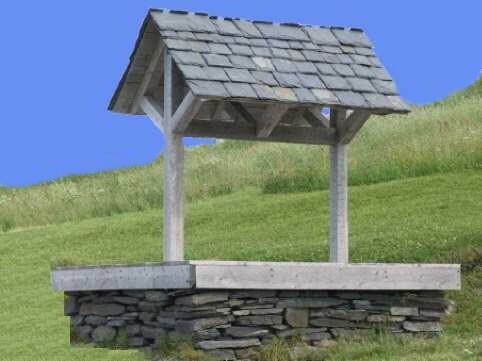 As a reward he was given a grant for Newfoundland. 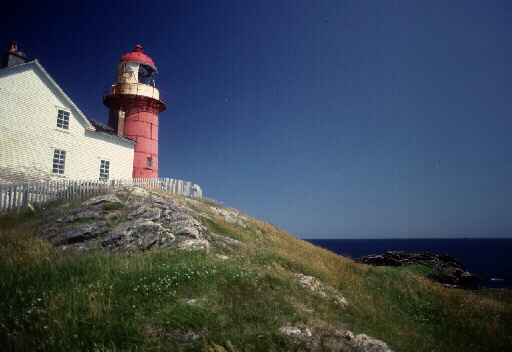 He established his headquarters at Ferryland. Kirke, like Baltimore, was a Loyalist and during the struggle between King and Parliament he offered Charles a refuge at Ferryland. He fitted out a fleet of ships manned with heavy guns to make an invasion of England in conjunction with Prince Rupert of the Rhine. The plan did not happen, and the victorious Parliament called Kirke home to England to answer the charge of rebel. As he had not actually taken part in the war, he was allowed to return to Newfoundland, but as a precaution Oliver Cromwell sent a British fleet to take every gun out of Ferryland. Kirke died there in 1655, and was buried on the Downs. The place of his tomb is unknown to this day. In 1991 Dr. James Tuck of Buffalo New York, became interested in the historic possibilities of Ferryland and began to dig. 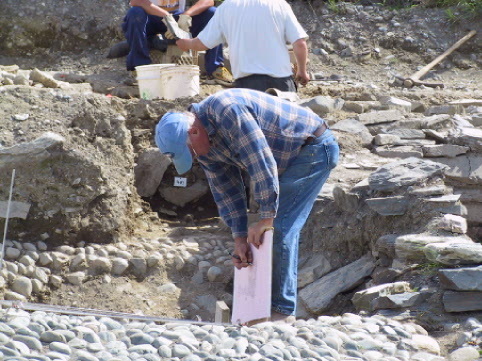 Colony of Avalon Foundation has witnessed a growth in tourists because there have been over a million pieces recovered from the archaeological dig. Dr. Tuck thinks that he may have found Lord Baltimore’s mansion. A foundation 14 by 43 feet has been found near the shore. It measures the same dimensions as mentioned in a 1621 letter to Calvert. Also a tobacco pipe was found in the area with the initials D.K, i.e. David Kirke. Arrowheads used by the Beothuck during the 1500s have also been recovered. This tells us that the aboriginal before the British inhabited the area. Dr. Tuck has uncovered a street that goes beneath the existing town and a sea wall that was used to make a pool for boats to anchor. Any visitor can watch as history is uncovered, or check out the artifacts from the immediate area at an Interpretation center. The center is open to visitors from mid June to mid October. Dr. Tuck has plans to excavate Lord Baltimore’s mansion during the summer of 2001. Tour the Colony online today!